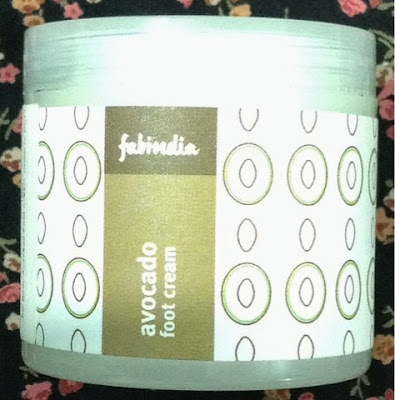 The Fabindia Avocado Foot Cream. One such product that claims to moisturize and soften the feet is The Fabindia Avocado Foot Cream . Read on to see my experience with this product . Price—It costs Rs 320 /- for 100 ml /99 gm . Packaging-It comes in an opaque plastic tub packing with a lid .There is no applicator given . What Fabindia Claims—Enriched with naturally moisturising avocado oil and beeswax , this cream effectively moisturizes and softens ,dry,calloused heels and feet . Ingredients---Purified water, Urea,Isopropyl palmitate,Glycerine, petrolatum, emulsifying wax,Beeswax,Cetylalcohol,Dimethicone, Imid urea, methyl paraben, Disodium EDTA , Avocado oil, Propyl paraben . Directions for use—Wash and scrub your feet before use , I use the Sally Hansen Pedicure in a Minute scrub. Just apply it liberally and massage onto feet ,paying close attention to heels and calloused skin . Cover your feet with cotton socks overnight to seal in the moisture . The Product—The Fabindia Avocado foot cream has a creamy and luscious texture .It has a very mild herbal fragrance.It gets absorbed easily .And for some reason it also soothes out the ache of wearng high heels .I take it along whenever I get Salon pedicures done and ask my pedicurist to massage the feet with this cream only . 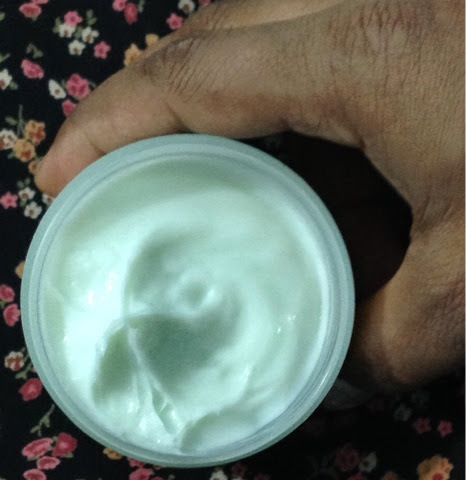 This is not a foot cream,it is a foot pampering treatment .A single use works wonders and leaves the skin much smoother and softer , it actually sloughs off the roughness of the feet and I find it good for minor cracks .I think it will even work for women with deeper cracks on the heels with regular use . 1. Easy to use .You just need to massage it on clean feet . 2. Absorbs well and leaves feet very smooth. 3. Pocket friendly prices .I am already onto my second tub . 4. Not tested on animals . 5. Contains natural ingredients . 1. Availabilty may be a problem . 2. Contains Parabens which are harmful for the environment . 3. Needs to be refrigerated in very hot and humid weather or the product may separate or become runny . 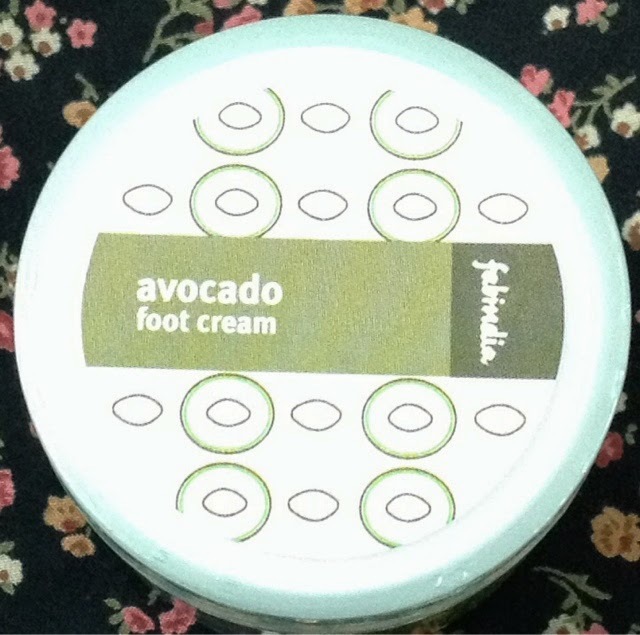 The Final Verdict—I would rate it 5/5 .FAbindia Avocado Foot cream is a product that stands tall against what it claims .This is already my second tub and I shall probably be buying it again . So tell me , which foot cream do you use ? I’ve tried other products of fabindia i’m a great fan now after reading the reviews i’ll certAinly try it. Let me know hit fares for you. very nicely described. I have never used any so far, so cant comment on your question. The price too appears decent. I am sure many will use this one. I am sure many would love it. I love fabindia pdts, especially their night cream. It's really great n leaves a soft skin in the morning. But I have never used this product, thanks for sharing. I have not tried their facial products as my skin is sensitive and I am very cautious. Had no idea Fab India had extended their product range beyond clothes and accessories. My feet can get really dry in summers so will check this product out. Neha , I am sure you will love how soft it leaves your feet. This cream looks a must have one. I need it for my heels so badly. Good that it is creamy yet gets absorbed very quickly in skin and is quite effective. It is quite soothing and good. I have used fab india's face scrub earlier and it was good. So I hope this foot cream will also work good for me. Not used any other face creams but yes I can vouch for this. Just follow the instructions,in case your feet need more care ,you can do it regularly. I do it once a week or when my feet need pampering. Me too - it has been a staple for me. I was not aware fabindia also had foot care products. Looks promising from your review. You will thank me if you use it! Actually I forgot to store it in a fridge this time ,but the cupboard was cool and dark and nothing happened to the cream so I guess you may do without putting in the fridge. Avocado is a wonderful ingredient for having soft skin. This cream looks best for moisturising and smoothing. I am really keen towards maintaining my feet. I generally use general moisturizing creams, but will surely try this one. This exfoliates dead cells and moisturises ,making the feet much more softer. I think lots of women will love it, its not so expensive also.